Curitiba's known history dates back to 1693, when Portuguese colonisers founded the village after discovering alluvial gold in the region. It was originally called Vila da Nossa Senhora da Luz dos Pinhais, which literally translates as 'Our Lady of the Light in the Pine Forest'. The settlement was renamed Curitiba in the year of 1721, and was officially listed as a town almost a century later, in 1812. The growth of Curitiba was very much based around its lucrative cattle trade, as the village was located between the northern markets and the southern ranches, where cattle breeding and farming was big business. Large numbers of immigrants from Europe began arriving in the middle of the 19th century, primarily from countries such as Germany, Italy, Poland and the Ukraine. The province of Sao Paulo was partially divided in 1853. Both the southerly and the south-westerly regions combined to create a new province named Parana, with Curitiba serving as its capital city. Perhaps a pivotal moment in the history of Curitiba was when it became the first city in Brazil to have a university, with the Federal University of Paraná (Universidade Federal do Parana) being opened in 1912 and now boasting a student base of more than 30,000. Just three years later, immigrants from Japan started arriving, which has in-turn led to the city now being home to more than 35,000 Japanese-Brazilians. The 20th century saw huge increases in Curitiba's population, as the city developed into a regional hub for trading and the service sector. In the process, it soon ranked favourably amongst Brazil's most affluent cities. The services of acclaimed Brazilian urban architecture, Alfred Hubert Donat Agache, were called upon in the 1940s. He was employed for roughly two decades to improve the city's infrastructure and come up with a more functional design for its layout. The emphasis of this plan was to create a downtown area with excellent amenities for the general public. There was also the need for an industrial district, an organised network of boulevards and an efficient sanitation system. However, whilst his 'Agache Plan' was followed to a certain extent, it ultimately became too expensive to finalise and these grand plans simply became the basis for some rather less ambitious and more practical designs. The population of Curitiba had increased to more than 400,000 by the 1960s, with some of the locals voicing their concerns that this dramatic rise could prove detrimental to the character and overall charm of the city. Soon after, Arzua Ivo Pereira (the city's mayor between 1962 and 1966), came up with some sensible design ideas in an attempt to address this issue and reassure the residents. Architect and urban planner Jaime Lerner (later to be the city's mayor) soon offered his experience in this field, being accompanied with his team from the Federal University. He proposed a reduction in urban sprawl, together with active conservation of the historic core. These proposals were accepted and at the same time, the downtown district saw traffic restrictions, while the network of public transport enjoyed significant investment and improvements. The Curitiba Master Plan, as it was named, was implemented towards the end of the 1960s. Vehicles were no longer permitted to drive down the Rua XV de Novembro, making this one of Brazil's earliest fully pedestrianised thoroughfares. Various new road layouts were adopted, including one-way streets and express-bus lanes, which enabled traffic to move more smoothly. Some of the earlier ideas of Alfred Agache were also taken onboard, including the 'star' of boulevards radiating outwards from the very heart of the city centre. The pattern of immigration seen over the last 150 years of Curitiba's history has changed somewhat, with only people from China, the Middle East and countries within Latin America arriving in any real numbers in the city. Even then, this is on a much smaller scale than in days gone by. 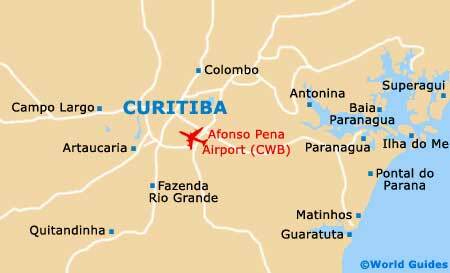 Most migrants to Curitiba are now from other regions of Brazil and it is estimated that somewhere in the region of half of the city's overall population comprises migrants.